For acrylic and oil painters with experience working in their medium. Demos will be done in acrylics. Painting on location is enjoyable - but difficult. The painter is faced with making choices from the vast amount of visual information, often under changing conditions, and in a limited time. Experienced plein air artists have an approach to planning their composition before they begin to paint. Time spent planning can speed the painting process and increases the chance of a successful painting/sketch and makes the day enjoyable. This three day plein air workshop will begin with one day of working together indoors. We will review fundamentals and approaches to simplifying the information and planning for strong composition. We will work together from supplied reference material. This will prepare us to better handle the two outdoor days with confidence and enjoyment. Brian retired from the University of Guelph (veterinary medicine) in 2001 and relocated with his wife Cathy to Comox B.C.. Shortly after he began his study with acclaimed artists in Canada and the U.S. In 2007, he committed to full time study at the Jeffrey Watts Atelier in California, drawing and painting from life. He continues to study with exceptional artists. He paints full time in oil and acrylics. His interest is the Canadian landscape, including painting on location (plein air). His work has been described as contemporary impressionism. Brian has won numerous competitions for both his studio and plein air paintings in British Columbia and in 2016 was honoured to be invited to participate in the 50th Anniversary Invitational Plein Air Competition at the McMichael Gallery (home of the Group of Seven Collection) in Kleinburg, Ontario where his painting, McMichael Morning, was awarded First Place. 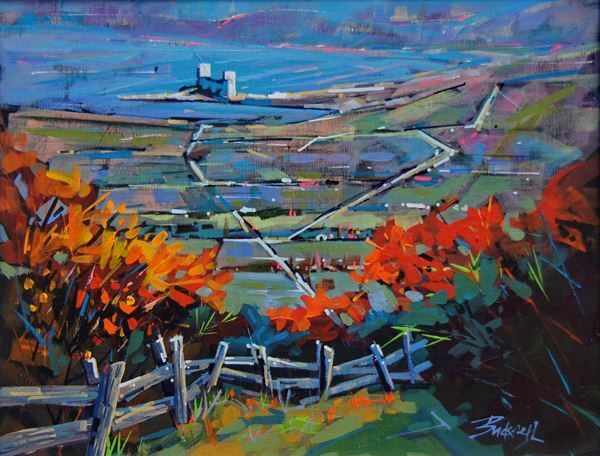 Brian's paintings have been featured in Arabella Magazine, South West Art Magazine and Plein Air Magazine’s Plein Air Today. He is also featured in the North Light Books: The Best of Acrylic Painters, 2014, 2015 and 2016. His paintings have sold across Canada, the USA and Internationally. Brian and Cathy share their time between Courtenay, BC. (Winter) and Collingwood, Ontario (Summer).